RoboCop is back to clean up the streets of Detroit again, to close down the facilities that produce the addictive drug Nuke, and ultimately face his nemesis, RoboCop 2. Seven levels of platforming and shoot-'em-up action await you in this game, which was only released on cartridge. First of all, let me say that no game demonstrates the extra features of the Plus and GX4000 machines better than this one; the scrolling is extremely smooth, and hardware sprites and the many extra colours available are used to great effect. It looks and feels like a 16-bit game! However, it is very difficult indeed, although if you persevere and don't lose your temper, you will eventually learn the full layout of the first level. If it were a bit easier, I would have no hesitation in giving full marks to this game – but it's not to be. 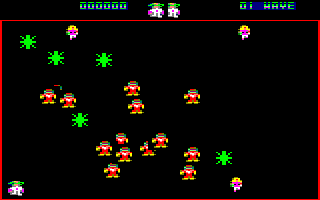 Robotron: 6128 sends us back to the beginning of the video games era with its pure arcade-style gameplay. Your task is crystal clear: be the only one alive on the screen when the level ends. The graphics are simple and blocky (MODE 0), and there is no background. 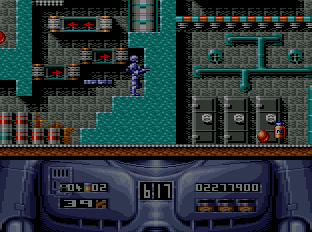 The sprites' appearance and attributes change from stage to stage. It would be much better if some background screens existed. In-game sound is composed of just the basic effects. However, the music on the options screen is one of the best I have ever heard on the CPC. The gameplay is fast-paced; you need to move and fire fast, and if you can, capture the girls! The brilliant control selection enhances this pure arcade experience and produces an addictive grab factor. Overall, although it is technically obsolete and improvements could have been made on graphics and sound, this is by all means an arcade treasure. 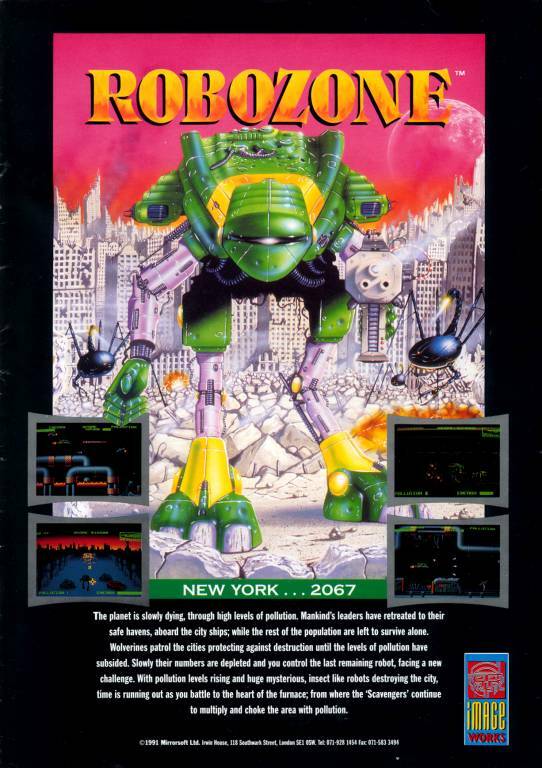 In the year 2067, the Earth's cities have become so polluted that they are patrolled by giant Wolverine robots. However, their numbers are decreasing, and you are the only one left to defend New York against another set of robots – the Scavengers. Your mission now is to destroy The Furnace, a building which is choking New York with even more pollution. There are three very different levels to this game. The first two involve exploring New York and its underground system, and aren't much fun to play, while the third is a much better space shoot-'em-up. The graphics are very nice, with detailed sprites and lovely explosions, but it's a shame that the gameplay isn't as good; the rather tedious first level will put a lot of people off. You may have guessed that this is a remake of Boulder Dash, where you collect gems while trying to avoid loosening the many boulders scattered around. This game is almost exactly the same, but Rockford is now human, and he gets to star in five different roles – as a hunter, a cook, a cowboy, an astronaut, and a doctor! 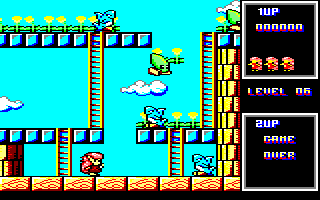 Each of these themes has several levels of their own, and the graphics also change to reflect the theme. The graphics are very nice, and so is the music, but, like the original game that it's based on, it's just too difficult for me. 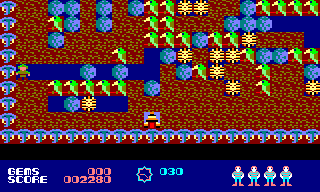 See also: Boulder Dash, Boulder Dash III. There is an old coin-op by Namco called Rally-X, which could be described as a cross between Pac-Man and Super Sprint. Well, this game is a sort of revision of that coin-op, with better graphics and music, but not as fast as the original. 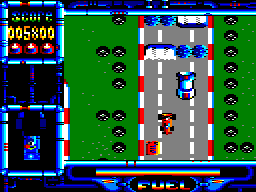 Your task is to drive your car around each level, collecting the parts of a racing prototype, while avoiding enemy cars and other hazards such as mines and traffic lights. Rock 'n' Roller isn't a great game, but once you manage to drive accurately, it'll give you hours of fun. 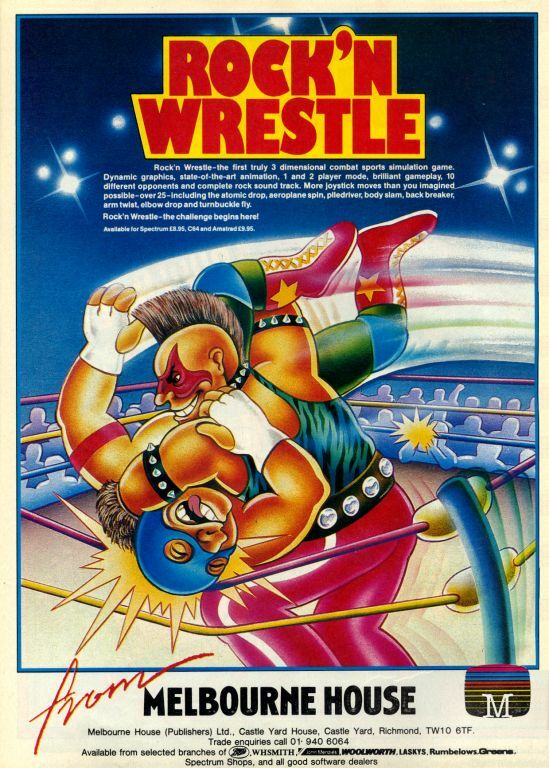 Rock'n Wrestle was probably the first wrestling game to be released for the CPC. To begin with, the graphics use MODE 0 and they are both blocky and not too detailed. 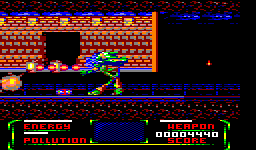 The sprites are big, but they move by byte and not by pixel, making animation not very smooth. The sound is limited to some effects which I found to be appropriate. And here is where the surprises begin; the gameplay is simply fantastic. With a big variety of moves, from grabs and flying kicks to simple punches and rope pushes, you can do almost anything you can imagine to your opponents. Another mega plus is that opponents' difficulty, style and appearance change from stage to stage. The playability is something that you can only understand by playing this game. The grab factor is very high and it is pushed further by some funny incidents during the fight – for example, when a fighter becomes dizzy. 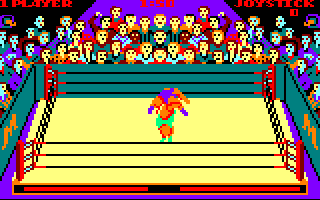 For me, this is the best wrestling game for the CPC. Stuck in a meteor storm, you must blast all of the rocks while avoiding them and therefore smashing your ship to pieces. Unfortunately, the rocks will split into two, and before long, you'll have a dozen rocks zooming around the screen and no room to get out of their way. You can also choose one special option, such as hyperspacing to another part of the screen, reversing, or using a shield or a smart bomb, or if you're really adventurous, a lucky dip. 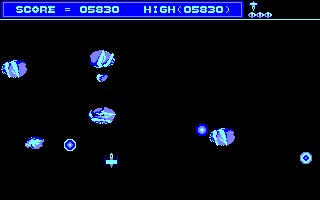 It's really a simple version of Asteroids and it's good fun – the graphics are good as well – but it is rather difficult. Your Auntie Mabel has left you £50,000 in her will, and you've decided to use it to break into the music business by forming your own band. You have to get four gold discs before the year is out. The game starts with you selecting the stars (including Tina Turnoff, Bill Collins and Michael Gorge), getting a contract, recording an album, and then releasing the album and singles to boost its sales. You'll also have to cope with charity gigs, stars quitting, and of course, the tabloid press! 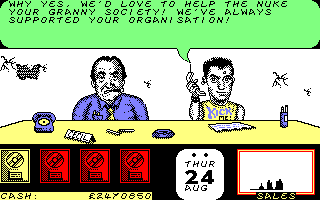 The graphics aren't that good and the music isn't much better, but you won't believe that being the manager of a band could be so much fun. One word of warning – don't play this game if you're easily offended! A strange little game based on the cult film and musical, this game has you as either Brad or Janet (witless hikers), wandering around the weird Rocky Horror mansion, collecting all the scattered pieces of the machine that can restore their partner from their frozen state, courtesy of the house's residents. 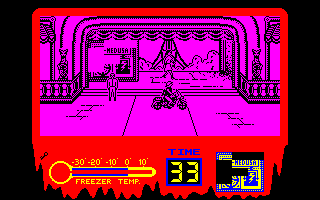 The graphics are very detailed and impressive but lack colour, while the music is really quite good. There's even a whole rendition of The Timewarp at the start, complete with dance moves! The game itself is very surreal – scarily so in parts – and there's even one baddie who steals your clothes, leaving you wandering the mansion naked, until you find them again! The down side is that the game is quite short and easy, as the time limit is generous, and bad guys can be very thin on the ground in parts. A game mainly for fans of the film. Those like me who've never seen it will be left cold. Rescue your Elven Mom from the top of the Maboots tower in this very cute platformer that owes a lot to Bubble Bobble. Clear all the monsters out on every level using your trusty magic wand to thwack them into very useful destructive power-ups, while collecting any bonuses on the way as you advance to the next. Boasting large colourful graphics, lovely sound coupled with simple yet effective gameplay, this is a stunning game. Watch YouTube videos of this game by: ChinnyVision, jgonza.